From the outset, Central Michigan University mandated LEED certification and green building measures as part of a campus-wide initiative. 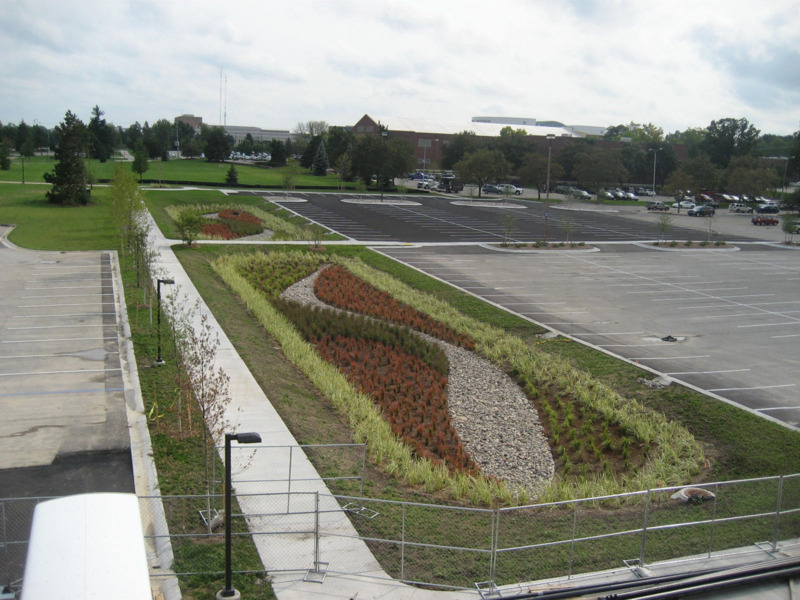 The project for new graduate housing featured several sustainable building techniques, including porous concrete paving in new parking facilities and a centralized rain garden as a stormwater treatment and conveyance device. NFE was tasked with and directly responsible for stormwater management and design, sanitary and water routing, grading, pavement design, tree preservation, landscape architecture, irrigation design and erosion control measures. NFE’s services were coordinated with project architect Neumann/Smith Architecture and other consultants. With the use of native plantings requiring less irrigation and minimal long-term maintenance, coupled with locally sourced materials and an energy-efficient building design, the project far exceeded expectations and earned LEED Platinum certification. This successful project is an example of the quality of work, attention to detail and practical experience that NFE brings to every project. Successfully and harmoniously blending into the existing campus, one of the first University-owned housing facilities in the Midwest with a Platinum rating represents a template for future building projects on campus.